After I did this for Nascar, I thought I should for WRC as well, as I’m an even bigger fan of this sport. When I was younger I remember watching Rallying on TV and seeing people like Colin McRae and Carlos Sainz doing incredible things for teams such as Toyota and Subaru. Unfortunately, those great brands and others like Mitsubishi don’t appear in the main WRC series at the current time due to the economy, but I hope this changes soon. This upcoming season does see the return of Mini, with their new Countryman car. Hopefully the other big names of the past decide to come back soon too, as there are not enough WRC cars competing at the moment in my opinion. While those manufacturers are still missing, I’m back watching after many years of letting the sport pass me by. The 2010 season I watched entirely on the review DVD and it was really great to see the incredible driving skills of these competitors. It was almost the perfect season for Loeb, who cruised to victory in his native French Rally. The event even finished by driving a special stage around his home town. It couldn’t have been a more perfect way for him to capture his 7th world title. Mikko Hirvonen however had an absolute season to forget after coming within a point of glory in 2009. He won the opening round in Sweden but that was as good as it got for him. 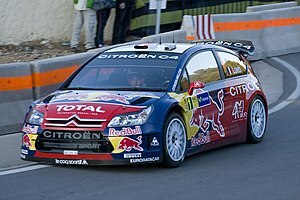 He quickly relinquished the lead to Loeb in the second event after a 4th place, and Sebastien and Citroen never looked back. He just seemed to either have trouble getting up to speed in events, or experienced some kind of car mechanical failure that took him out of contention. It ended up being his team-mate and “number 2 driver” Yari-Matti Latvala who somewhat ironically ended up in the runner-up spot for the season over his more experienced and favoured team-mate. I think it was a great season of a great sport with arguably the best drivers in the world, especially Sebastien Loeb who is undoubtedly the best rally driver ever in my opionion, and maybe one of the best drivers in the world generally. Not too many people would disagree with either of those points. I just feel that because rally drivers have more adjustments to make, different surfaces to drive on and stages to learn, they have a harder time of it than F1 and other circuit racing drivers do. In 2011 I’m excited to see how the new, smaller cars work and how well the drivers adapt to them. It will also be interesting to find out if the Citroen DS3 WRC can follow the untouchable C4 in being as competitive of a rally car. It’s going to be hard for them to dominate as they have done even with Loeb behind the wheel however. These regulation changes give Ford a perfect opportunity to close the gap to the French team. How will Mini do in their first season back and can Kimi Raikkonen and Ken Block improve on their troubled but promosing WRC debut seasons. I’m excited to find out when Rally Sweden starts on the 10th of February.